Happy holidays from Nourishmnt! This bonus content is designed to help you to enjoy the food and festivities of the holidays to the very fullest! Holidays should be a time of joy, not stress about food! When you think about the holiday season, how does it makes you feel? Happy? Joyful? Excited? Or does it make you feel anxious, stressed, or concerned? 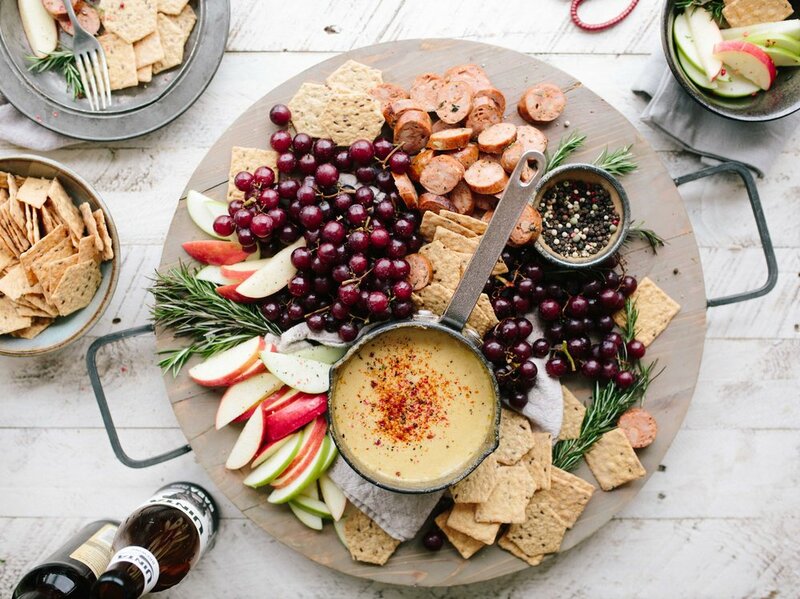 While the holidays are a very joyful time, there are so many negative messages in the media that tell us to make “skinny" versions of our holiday favorites, to exercise to “earn our holiday foods” and to make resolutions to undo what we’ve done over the holidays. This messaging is flawed and unhelpful. While so many companies profit off of making people feeling guilty for their holiday indulgences come New Year’s, interestingly, the average American gains a mere ONE POUND over the holiday season. Instead of approaching the holidays as a tightrope that you have to carefully walk in order to not fall off, realize that with a mindset of balance, intuition, and abundance, you can honor your body and enjoy the holidays to the fullest! 1. Cherish the holiday food traditions that matter to you. During the holidays, thoroughly enjoy the special treats that mean something to you, and if you never really liked those store-bought cookies anyway, consider mindfully passing on them. 2. A healthy lifestyle involves weaving in healthy meals AND indulgent meals, regardless of the season. Remember that Thanksgiving is one day! Go ahead and indulge. Make great grandma’s stuffing recipe with 2 sticks of butter in it. (Yes, my great grandmother’s stuffing recipe has two full sticks of butter in it! ) Between the celebration meals, focus on nourishing your body with foods that make you feel great. 3. Make activities a part of the festivities! Instead of only focusing on the food, why not encourage a family football game, hike, movie outing, karaoke, or other non-food activity. It may become a new tradition! 4. Ditch the dieting mindset. Remember that all kinds of meals fit into a balanced healthy lifestyle, and that the all or nothing mindset will only ever hold you back. 6. Honor and listen to your body. Check in with yourself and ask yourself what you need. Does your body need rest? A walk? An apple? A piece of pie? Some time to relax and read? Staying tuned into your body’s needs is important during the holidays, and every other day of the year, too! Festive cocktails are often a part of the holiday celebrations. If you do choose to enjoy a few cocktails over the season, here is some info to help you to make choices that honor your body. Much like mindful eating, practice mindful drinking! Sip your drink slowly, enjoying the flavor of the drink, instead of mindlessly and quickly gulping it down. Make it last, and savor the flavor! This can help with moderation. Remember, you don’t have to drink to be festive! 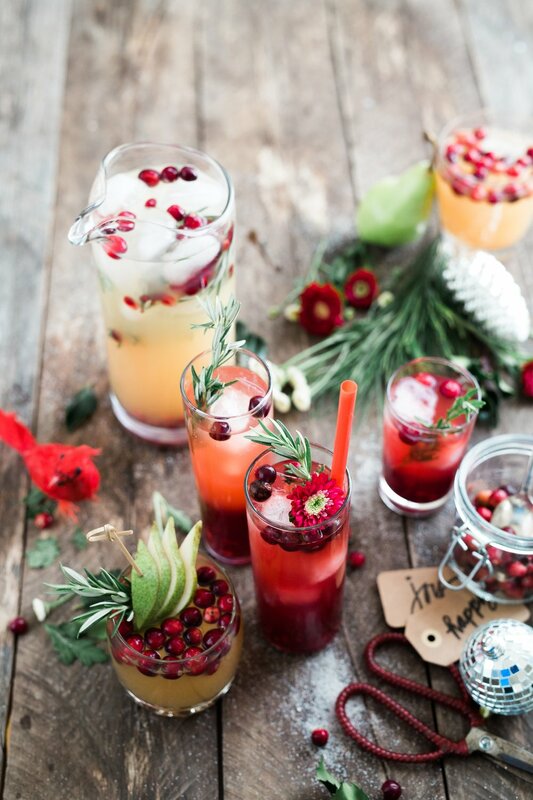 Check out this festive holiday mocktail recipe! Moderation is defined as one drink a day for women and 2 drinks a day for men. Trying to drink moderately but interested in having more than one cocktail? You could make a spritzer! Fill a glass with a half of a serving of white wine (2.5oz), then top it off with sparkling water, a splash of cranberry juice and a squeeze of fresh lime juice for a pretty and festive spritzer that has half of the alcohol of a full glass of wine! As always, listen to and honor your body. This time of year especially, it is so important to remember that food is joy, that restriction and deprivation make it harder to have a healthy relationship with food, and that all foods that are important to you can fit into your healthy and balanced life. Throughout the holiday season and into the New Year, honor your body with delicious foods, gentle nutrition, and joyful self care.